New Minecraft 1.13.2 Vanilla server now up! Discussion in 'PC Games' started by haaammit, Dec 13, 2018. How do you get it zoomed out so far - mine won't go that far. I've changed the worldmap options to 0.125x zoom but it won't go any better than that. What do we think - should we keep the dynmap or not. I'm open to suggestions and don't mind either way. I can hide player locations if people prefer - let me know your thoughts. @LewisRaz you can still use him to breed with, so not a total loss! Looking at your base, there's a village not too far away to the South West and it's right on the coast so a better bet might be to go collect a couple of villagers and bring them back using boats and the sea to start off, as zombie villagers aren't *that* common. Ham, went to your base to use the existing villagers for enchantment trades to replace some of my lost gear. It seems I cannot access them as there is no way down and I don't even have permission to ender pearl down there, didn't have this issue earlier when you were on and I visited your place? Ah poop - I moved my claims about to cover the castle etc! I'll make some stairs or a bubble elevator down there. I usually fly down there, as it is very much a work in progress lol! Edit: I've put in a down bubblevator. Don't forget to crouch when you exit so as not to take damage from the magma block at the bottom1! Nice one! Had half an hour to kill after posting yesterday so thought I'd see if it would be easy to do and thought whilst I'm here, go for it lol!! I wouldn't go to mad on breeding them until you get decent storage for them as they are a royal pita to move about when there's lots of them! Obvs keep the place well lit as well. If you store them in a room with a dispenser in one corner with a bucket of water in you can flush them to the opposite corner and pick them out one at a time using minecarts. If you look at my breeder at my place you'll get the gist. The dynmap render for the overworld is now complete (took 4 days to do, but was over 1.1 million tiles lol). Newly explored land will now be generated live. Edit: I've updated the op to include info about the dynmap and also what public farms have/are being built. Overworld, Nether and TheEnd are all now fully rendered on Dynmap and should update when new chunks are generated! 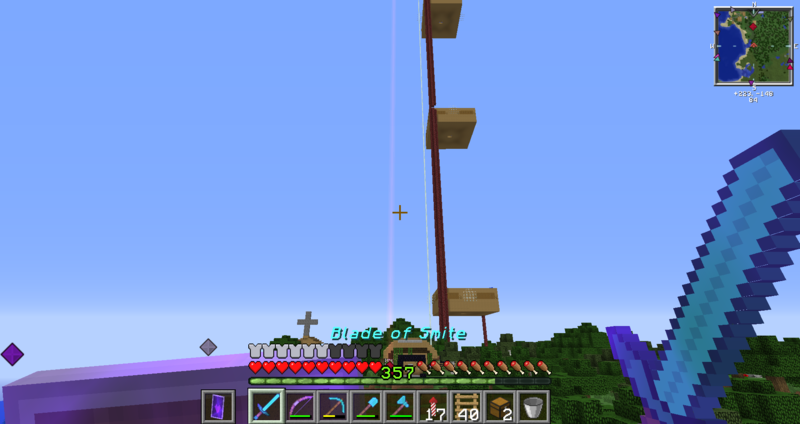 An iron farm in spawn chunks seemed the way forwards as it will be loaded 24/7. Managed to get in all four villages and have loaded the top two (the most difficult) ones with villagers in the villager pods. Another day should see this project out. Not sure whether to just leave the chests (when I build the storage) open to all players or to do what I've done in the past and made it so you can only get new, afk'd loot you afk'd yourself. Open to ideas. I hope to see this project out tomorrow! The Guardian Farm is coming on nicely, thanks in no small part to Sylvet aka @hegemon - nice work mate Also, the Witchfarm - can I setup an afk spot and make chests accessible to all? Let me know. I'm keeping the flowers for now but will probably start dumping them after I have a dub or so. Can I ask that no wooden doors are added near the farm for the foreseeable future so as we can maximise rates? Ta. @haaammit Can you add my cousin to the whitelist? unrelated, we used to have a modded server somewhere abouts, which had factory mods (mining etc) I really want to know what those mods were! Was it on the old Linktart server? I never got into modded on Linktart - maybe @FrenchTart or @5punk3monk3y or @yrthilian may remember what mods were on it? It depends, we ran a number of servers but the mods have moved on A LOT since then if I recall it was at one time a direwolf mod pack and I also believe we used monster at one stage.